​Betsy Munroe thanked all those who have been involved in preparing the year-end District award applications. It’s about a 20-page list of questions summarizing what clubs have accomplished and done over the year. Thanks for input from Kim Coley, Bill Ringer, Janet Napier, and Lucille Ramirez. Special thanks for coordinating all this into the package that was sent to the District this weekend is Diana Cecala and Betsy Munroe who deserve several gold stars. President-elect ​Dana Goba announced her Board for 2014-15 year. 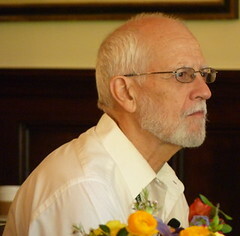 Tom Heath invited members to help at Camp Whittier on May 17. Landscaping, painting, weed whacking, and more. Susan Klein-Rothschild announced there will be another free dental clinic on May 16, serving students and seniors. 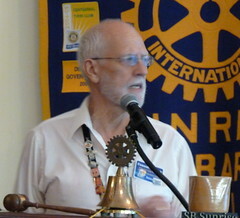 Bill Boyd reported on the Rotary Work Day on 4/26 at Elings Park. They distributed mulch around the picnic area. They pulled out bender board and replaced it with rocks to define the boundaries. Thanks to Mark Reinhardt who provided truckloads of rock to the project. Janet Napier explained that each year two members cycle off of the Foundation Board, and we’ll need two new members. If you’re interested in serving, self nominate — let Janet know. 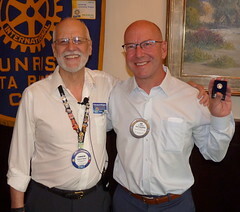 Thanks to Don Bennett and Fred Gaeden for their service. To be on the board, you need to have been in the club for three years first. Diana Cecala needs someone to move flag into meeting room for 5/14, 5/21, 5/28, and 6/4 while E Russell is away. Also to pick Brooke up at 6:20 a.m. Bill Boyd will help with the room. Thanks, Bill! Getting To Know You with Bill Abel. What college did you attend, why and what was your major? Cal Poly San Luis Obispo, then University of Washington, then Cal Poly again. He started in electronics engineering, and later switched to business. He always wanted to be an engineer. Sandy Grasso-Boyd. Name an item that’s on your bucket list. Go to South Africa breast-cancer free. Bill Boyd. What is something you want to learn that you haven’t learned yet? How to be an even better husband. Raffle Results: Diana Cecala announced we raised $92. Claude Saks won the raffle. Pay & Tell with Sergeant at Arms Joe Weiland. ​Program: Joanne Orenstein introduced: Tim Metzinger, an attorney-historian sharing The Owens Valley Water War. The Owens Valley is at the Eastern Sierra along Highway 395 in Inyo County. It was named for Richard Owens. We’re used to seeing it as an arid, dry expanse. It used to be more lush and green when it had water. The Valley traditionally got water from the Sierras and filled the Owens River. Farmers created irrigation systems from the river to their lands. In the late 1800s, Los Angeles was experiencing a 12-year drought. They fought for full rights to the Los Angeles River and won. Fred Eaton eyed the Owens’ Valley’s water. He met William Mulholland to discuss. A report identified that the Owens Valley could damm a narrow spot and create two channels that could irrigate a huge area. A race began to secure rights to the Owens Valley water between the Reclamation Service in the Owens Valley and Los Angeles. LA won. The aqueduct would be a $23 million project. It was largely funded by a bond measure. They even created their own cement plant. Water could flow by gravity from the Owens Valley to Los Angeles without a single pump. Tubes were pressurized by the water. The Elizabeth Tunnel was the most difficult part through the mountains — 5 miles long. They broke some hard rock drilling records. It created a lot of civic pride and sparked incredible growth. LA annexed more and more land with a basic principle: If you want our water, you have to be part of our city. People who had advance knowledge of the aqueduct plan bought up land in San Fernando Valley and made fortunes. Initially, this wasn’t too bad for the Owens Valley residents because most of the agriculture was above the start of the aqueduct. But then, in drought years, the ditches above the aqueduct took the majority of the water, leaving LA with less. So LA kept buying water rights above the aqueduct, too. Valley farmers sabotaged the aqueduct in multiple ways over the years. They realized they could not defeat Los Angeles. The 1930s were a sad time for the Owens Valley. People moved away. Land dried up. Mulholland also built a St. Francis damn that later broke and killed hundreds. Today the Owens Valley markets itself as a vacation destination for its mountain recreation. Father Crowley helped bring peace back to the Owens Valley. As a token of our appreciation, it is the Club’s practice to donate 15 dictionaries to local 3rd graders in honor of the speaker.